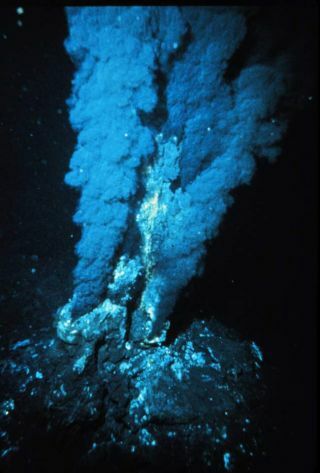 Hydrothermal vents spew hot chemicals into the surrounding environment. This is Part 5 of a six-part series telling the story of humankind’s efforts to understand the origins of life by looking for it in extreme environments where life thrives without relying on the sun as an energy source. It follows an oceanographic expedition to the Mid-Cayman Rise led by Chris German of the Woods Hole Oceanographic Institution, and NASA’s efforts to plan a future mission to Jupiter’s moon Europa. By understanding how life can live without the sun, we may discover how life began on our planet, and whether or not Earth is the only place in the universe capable of supporting a biosphere. As he watched Florida recede in the distance, thoughts of the journey behind and the one lying before Chris German filled a hopeful mind. This voyage to the Mid-Cayman Rise (MCR) was planned to last 22 days. In 28 years of exploring since he began his PhD studies at the University of Cambridge, German has spent around 1,000 days at sea, about on par for a modern-day oceanographer. It’s a life of discovery and adventure, but it also demands sacrifices; while at sea, he has missed his wife’s birthday (twice), his older son Martin’s 18th birthday, and his daughter Helen’s 16th birthday (while in the Antarctic). Now on the vessel Atlantis, bearing down on potentially the most significant sampling of hydrothermal vent sites on the planet, German hoped real discoveries would be waiting for the team somewhere about 400 miles (644 kilometers) south of Havana. In addition to grabbing temperature readings, biological samples and close-up shots of the vents, German and his colleagues wanted to study the MCR for what it can tell us about Earth’s history. Since the MCR is an ultraslow-spreading ridge, it acts differently than its faster counterparts. Usually rocks get older the farther you go from the spreading center of a mid-ocean ridge. That’s because new seafloor is being created by magma erupting and then cooling and molding together with the older surrounding seafloor. But at ultraslow-spreading ridges, the rate of magma generation doesn’t always keep pace with the rate at which tectonic plates are being pulled apart by subduction processes. These processes may be nearby or many thousands of miles distant at the far end of the plate, where older, colder and more dense sections of ocean crust sink back into the underlying mantle. Along key sections of the MCR, this movement of tectonic plates resembles a condition you may find on your bookshelf. Imagine removing a bookend to allow a row of books to tilt over on their sides. The upper face of a book cover that slides up and into view is like the rock that formed deep beneath the seafloor but has now slid up to be exposed at the seafloor where seawater-rock interactions can give rise to unusual hydrothermal systems. The remotely operated vehicle (ROV) Jason returns from a dive to a deep-sea vent. At 9:45 p.m. on Jan. 8, Atlantis reached her destination above a hydrothermal vent site called Von Damm, which was named after the late geochemist Karen Von Damm. After 2 1/2 days in transit, the ship rocked in the calm waves, keeping relatively stationary by use of one bow thruster and the stern propellers since her anchors couldn’t reach the seafloor, 7,500 feet (2,286 meters) below. On the deck beneath two 42,000-pound (19,051 kilograms) capacity cranes sat the Remotely Operated Vehicle (ROV) Jason, named after an ancient Greek mythological hero famous for leading a group of adventurers called the Argonauts. Jason is the most capable U.S. academic research vessel roaming the seas today, able to reach 99 percent of the world’s seafloor at depths down to 21,000 feet (6,400 m). The vehicle is also nearly indefatigable. It can work 24 hours a day with the help of a pilot, navigator, engineer, and three scientists. That means teams of six rotate through four-hour shifts, allowing Jason to remain submerged for many days at a time for continuous imaging, observation and sampling. Chris German is thankful for his robotic helpers and their human watchmen. He relies heavily on the engineering team for real-time adjustments to the dive plan and troubleshooting the Jason/Medea vehicles. Without the team’s constant attention to the robots, photos of vents, samples of tubeworms and up-close sonar mapping of the seafloor would not be possible. The robotic submarine Jason sampling a hydrothermal plume. The next day, the engineering team had Jason ready to go by noon, but a few technical difficulties pushed the inaugural dive back a few hours. By 4:30 p.m., Jason was on the ocean bottom with all systems running. Its first photos from the deep were of weathered rock outcrops, a few fish and shrimp, mussels and tubeworms. Data were displayed in an operations van, a mobile boxcar of screens and instrument displays for monitoring Jason’s progress that shared the deck of Atlantis with a host of equipment. Using its manipulator arms, Jason collected five tubeworms, a clam and a sea cucumber. The science teams started working their round-the-clock shifts. Twenty-three people from nine institutions in three countries made up seven science teams. There was the Carbon Team, consisting of Max Coleman and Sarah Bennett from NASA’s Jet Propulsion Laboratory in Pasadena, Calif. They wanted to track the state of carbon as it exits from the vent sites and how it gets altered through the food chain. Just about everything seems to revolve around carbon. It’s an organic element, so biologists study it because it tells you something about how life has evolved there. It can be preserved in rocks, so geologists want to measure it to figure out the ages of their samples. It gets spouted from superheated vents, so chemists want to know what it mixes with. That’s why Coleman and Bennett are part of each of the other teams as well — the Plume, Biology, Geology, Fluids and Microbiology Teams — in order to get at the bigger picture of all things carbon in and around the vent systems. After Jason’s first dive was declared a success, the crew of Atlantis brought the ROV back up to the surface. Securing Jason and Medea to the deck and distributing samples among eager science teams, Atlantis made for the second target, named the Piccard vent site (named after late undersea explorer Jacques Piccard), merely two hours’ cruise away. Several views of a deep-sea vent system, as seen by the robotic submersible Jason. By the time Jason submerged for its 10th and final dive of the expedition, Chris German and his team could already declare this mission a success. The team had returned to the Von Damm site for a final look at the rocks surrounding the hydrothermal system. "There are some conditions you need to understand when thinking about the origin of life," Klein said. "The key components are pH, hydrogen concentration, methane, CO2, and temperature, which we try to constrain using the rock record." A particularly interesting rocky outcrop north of the vent site appeared on the screens at around 9:00 p.m. The ROV pilot reached out with Jason’s robotic arms to grab hold of the rock and pull. The rock didn’t budge. He tried again, maneuvering Jason’s arms to try a different angle. Still, nothing moved. After an hour-long struggle and with more biology and fluid samples to collect, Chris German called off the assault. The team dubbed the outcropping "kryptonite." By 4:00 a.m., Jason and Medea were still at work and Evans, Klein, and Hodgkinson came back to the operations van to resume the rock hunt after a brief rest. At 6:00 a.m. Jason returned to the area where it had wrestled with the "kryptonite." A near-identical outcrop once again filled the screens and the team resumed the attack. Thirty minutes later, Jason’s strength was still no match for the rock. With another 30 minutes left of the team’s final dive, the Geology Team decided to move on to look for a more pliable sample. Thus far, samples of mantle rocks — the ancient seafloor thought to be dragged up by the sliding-book-on-the-bookshelf tectonic plate at this ultraslow spreading ridge — had not been collected. If found, these rocks would help tell the story of the early ocean seafloor and, potentially, the environment surrounding the original genesis of life. The Geology Team wondered if Jason was wrestling with a primordial clue. Tubeworms collected from a deep-sea vent system by the remotely operated vehicle Jason. Fifteen minutes before the end of the dive, the team found a third outcropping, which was similar in composition but slightly more weathered than the previous two. They decided to let their robotic friend engage in one final boulder brawl. With three minutes left on the clock, Jason, leader of the Argonauts, broke free a chunk of the "kryptonite" the size of a Thanksgiving turkey-serving platter. Back on deck, it didn’t turn out to be kryptonite at all, but rather basalt. Tough, tough, layered basalt — a common form of volcanic deposit on the seafloor. Interesting, but not the clue they were looking for. Maybe the sought-after mantle rocks were covered in sediment. Maybe they weren’t there after all. Or maybe they were still buried beneath the seafloor, shallow enough to interact with the circulating seawater but not exposed at the seabed. That, along with a continuous stream of unresolved questions reflecting the eternal curiosity and resiliency of the human spirit, will be up to future explorers to battle. This story was provided by Astrobiology Magazine, a web-based publication sponsored by the NASA astrobiology program. Follow SPACE.com on Twitter @Spacedotcom. We're also on Facebook & Google+.